Better Together: At Camp Knock Knock, Grieving Families Find Support and Solidarity | Features | Kids VT - small people, big ideas! Holly Curry was feeling nervous as she and her daughter, Jane, set out for summer camp on June 3, 2016. The Burlington mom wasn't worried about missing her then-5-year-old daughter — the two would be attending camp together. Rather, the day marked the one-year anniversary of the death of Holly's husband Jonathan, Jane's father. He died at age 41 from cancer. "I just wanted to crawl away and be alone," Curry said. "The last thing I felt like doing was being with other people." Instead, the pair were heading to North Hero, where they'd check in at Camp Knock Knock, a weekend-long retreat designed specifically for grieving families dealing with the loss of a loved one. 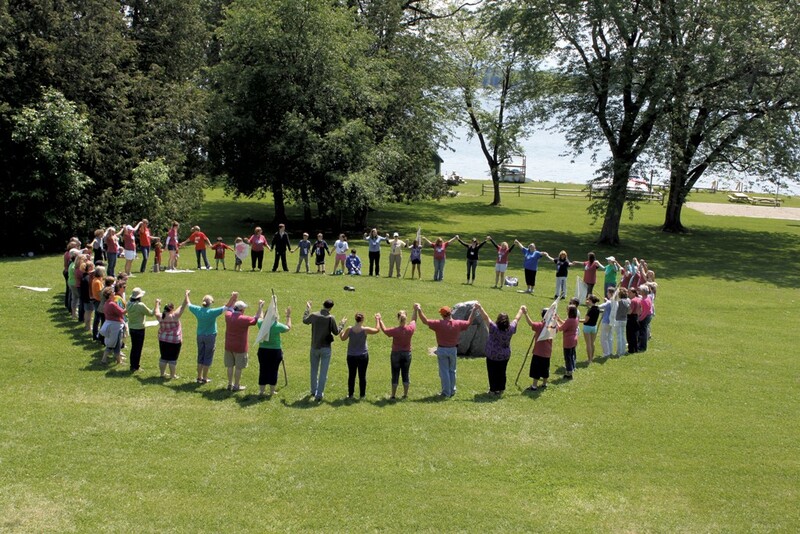 Located on the grounds of YMCA Camp Abnaki, Camp Knock Knock is run by the Visiting Nurse Association of Chittenden and Grand Isle Counties, and is staffed by more than 40 volunteers, including former campers and social workers who specialize in bereavement. Curry, a physical therapist, thought the experience would "dredge up a lot of painful emotions." Instead, she recalled her two days there as positive, and a respite from the demands of single parenthood. The programming at Camp Knock Knock is a mix of standard camp activities — recreation, arts and crafts, campfires — and group therapeutic sessions organized by age. "The volunteers, they just take care of you," Curry said. "From dawn to dusk, there's something going on. As a parent, you don't have to think about what to eat, what to do." Camp Knock Knock's services came at a critical time, Curry said, when she was both grieving personally and guiding her daughter through her own grief. "It's pretty intense, and can be overwhelming at times," Curry said. "Even with all the support of family and friends." The Junior League of Champlain Valley recognized this need 20 years ago. The international, nonprofit women's group promotes volunteerism and supports a range of community projects. Its local chapter's leaders collaborated with social workers and others from the Visiting Nurse Association to establish the camp. "We were looking to provide more hospice support care post-death, for families in particular," said Cathy Foutz, a founding member and the camp's volunteer coordinator. "We really liked the idea of a weekend camp for families with children." The camp is named in honor of Alisha Reis, the first child to receive hospice care from the VNA, according to one of the camp's founders. Alisha, who died at age 7 in 1988, loved knock-knock jokes, and shared them with her hospice caregivers. Silly time, filled with jokes and laughter, has become a tradition at camp, said bereavement care coordinator Ally Parker. Each year, 15 families from all over Vermont attend Camp Knock Knock. Typically they have experienced a loss within six months to two years, but sometimes it's been longer. Family members live together in a cabin, but participate in activities and group sessions independent of each other. "Our focus and emphasis is really on grief as it impacts the family unit," said Parker, who emphasized that many different kinds of families attend the camp. Camp Knock Knock staff also recognize that all members of a family experience grief after the death of a sibling, parent, grandparent or other close family member, she said. "One thing that is helpful for kids is not to be pegged as the people in the family who need support because they are grieving," Parker said. "They are grieving as part of a family ... the adults are grieving as well. When the loss happens, it's not just the children who need support." Tara Graham, VNA's executive director of hospice and palliative care, said in her two years at camp she has observed a "collective opportunity to have that grief normalized with other people who are grieving." "The whole idea is that we're holding a space where there is no judgment about the grief process," Graham said. Within the collective framework, she said, each participant — from young child to older adult — "has their own little journey during the weekend." Parker Merchant, 19, went to Camp Knock Knock with his parents five years ago, about a year after his younger brother, Taber, died at age 11. That summer, the teenage group had just two members, which gave him a lot of one-on-one time with counselors. "Everyone is different," Merchant said. "But as far as I go, being able to have a safe space to open up about it opened all the doors at once." He said that after going to camp, he felt more comfortable talking about his brother's death, and that the experience gave him "kind of like a freeing sense." He is now a Camp Knock Knock volunteer, organizing activities for kids and spending free time with them. Though he has no formal counseling role, he's receptive to whatever a child might want to discuss. "If I'm hanging out with a kid and they want to talk, I'll talk," Merchant said. "But I'm really just a buddy to hang out with at camp — to have fun and relax between group times." During sessions related to grief work, activities are geared to different age groups. Young children may get a treasure box with symbolic items to place in it, like Band-Aids or a key to "unlock your heart," explained Parker. Some activities for older children incorporate the act of "naming your feelings," Parker said. She described one called Rainbow Tears in which a group of 10 to 12 year olds take turns squirting drops of food coloring into a clear vase of water. Each color is attached to a feeling, which is articulated when the child adds a drop into the vase. As more and more colors mix in the water, the liquid becomes gray and murky. This is what grief will feel like, a facilitator tells the campers — a lot of feelings swirling together that are difficult to distinguish. Next, a cup of "magic liquid" (it's actually bleach) is added to the vase, and its murkiness starts to dissipate. The water never clears up entirely, but becomes a translucent orangey-yellow. "It's the same with grief," the facilitator will say. "When the murkiness lifts, it doesn't go back to what it was, but you can see through it and work with it." Holly Curry said she was initially concerned about how her daughter would fare, participating in the kids' activities on her own. But once Jane settled in — and the camp gave time and space for that to happen — "she delved into activities and really enjoyed herself." In June of this year, she and Jane, now 6, returned to camp for a second weekend. The reservations Curry had before her first trip to Camp Knock Knock, it turns out, are common. "What we remark about every year is that when families come in Friday evening, they are apprehensive, nervous, quiet," Parker said. "They really don't know what to expect and they are wondering, Why the heck did I bring my kids to grief camp? "By Sunday, they are so much more comfortable," she continued. "They're expressive; they're laughing; they're sharing things with each other. "We call that the magic of camp." Young people might find it difficult to talk about the death of a loved one, said Matt Price, a clinical psychologist and assistant professor of psychology at the University of Vermont. They might also have a hard time articulating their feelings, or be unsure of what to say, Price explained. Adults might also find that death is a difficult topic to discuss with kids, and avoid conversations in an effort to protect them from feeling hurt or upset. "In subtle means, it might come across as, it's bad to talk about this," Price said. In addition, when adults are struggling with their own grief, "it's hard to take care of the needs of the child." Price suggests that families communicate "at the level they feel comfortable with ... If your child wants to talk with you, then you should let them talk with you," he said. "If your child doesn't want to talk with you, you shouldn't force them to."